The Hot Hand in Sports: Hot Hand in Volleyball? Science News has just published an article on research by German and Austrian investigators purporting to document a hot hand in volleyball spiking, and the reporter was nice enough to contact me for comment. A hot hand in this context would mean that a player who has successfully put away a few spikes in a row (known as "kills") would have a higher likelihood of a kill on his or her next spike than the player's long-term kill percentage would suggest. 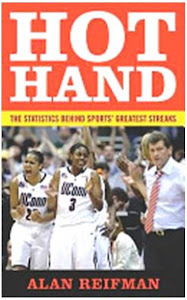 A cold hand would represent the opposite, that a player whose last few spike attempts have resulted in errors (e.g., ball hit out of bounds) would have higher than usual odds of an error on the next attempt than his/her long-term percentages would suggest. Within the constraints of the data set to which the authors had access (partial game-sequence data from top players in a German men's professional league), the analyses were conducted with full rigor and in a manner consistent with previous hot hand research. However, as I elaborate below, I feel there was at least one major limitation in the available data. An analysis of playoff data from the 1999/2000 season for 26 top scorers in Germany’s first-division volleyball league identified 12 players as having had scoring runs that could not be chalked up to chance. Hot-handed players’ shots contained fewer sequences of consecutive scores than expected by chance, the result of a small number of especially long scoring runs. As volleyball fans know, however, there is a third category of outcome for spike attempts, namely the ball is dug up (or otherwise kept in play) by the defense, and the rally continues. As I told the reporter, I definitely think those hit attempts should have been included in the analyses, but they apparently were unavailable in the data set the authors received. Hitting errors were very rare in the data, so balls kept in play may have been a better measure than errors of unsuccessful spike attempts.